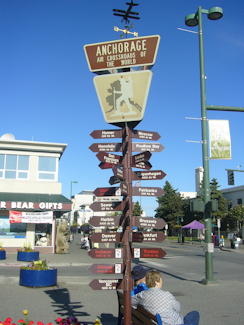 This is the first article in a series about our vacation in Alaska. To see the introductory article in the series, click here. Our 3:30 pm departure allowed us to start on a very leisurely note. Jim and Shirley drove down from their home in the Sierra foothills, and we left for SFO right after lunch. Everything was happily uneventful with the minor exception that I was designated for a “SPD” (Standard Pat Down) after my trip through the millimeter-wave imaging machine. No problem. The flight was on Continental Airlines, which, despite having been acquired by United last year, seems to still operate as an independent airline in some respects and not others. This flight was “operated by Continental” and had a United flight number on a code-share basis. I booked seats, all five of us in the same row in the premium Coach section, because the reservation system saw that I was a Premier flier on United. I later got a confusing email message from them about a change of flight numbers, so I reconfirmed the seats, only to be told that I was not entitled to premium seating on Continental. But when we got to the airport, we were assigned our original, premium, seats. I have learned to expect the unexpected when code-sharing is involved. The beginning of the flight was clear, with an unusually great view of the mountains in Washington. I was happy to see that United (Continental?) allows use of GPS receivers in flight, so we could identify some of the mountains. When it clouded up later, we could see better where we were and how much time remained. 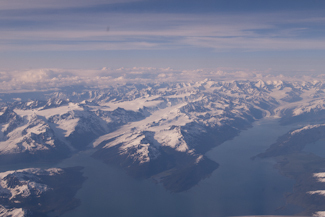 It cleared up again as we approached Anchorage, and gave us a great preview of things to come: glaciers and mountains along the Gulf of Alaska. We landed and picked up our transportation for the week, a Toyota Sienna van that was just the right size for the five of us and our luggage. We stayed at the Marriott in downtown Anchorage. It was about this time that we began to experience the unusual length of daylight in the Alaskan summer. We decided to walk a few blocks to dinner, and had a great light dinner at a local place called the Snow Goose. I tried one of the local microbrews, Sleeping Lady amber ale, and it was excellent. Alaska, or at least Anchorage, seems to have a well-developed beer culture judging from the number of brewpubs we saw. It’s apparently something that can carry on through the Alaskan winter. We also got our first tastes of Alaskan smoked salmon…..mmmm! My current vehicle is a Sienna. It holds an amazing number of passengers and gear (or dog crates and gear). Nice aerial shot of the mountains.